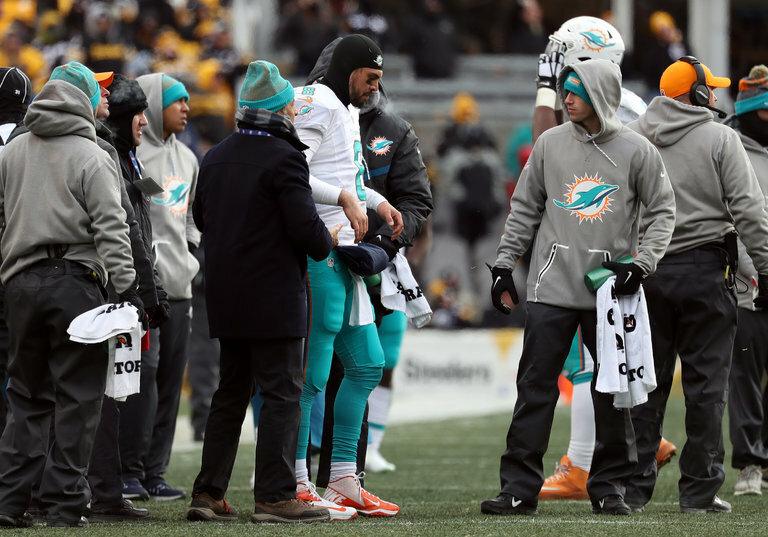 Dolphins quarterback Matt Moore received attention on the sideline after taking a hit against the Steelers on Jan. 8. The N.F.L. said Thursday that the number of concussions had fallen 11.3 percent this season, compared with last season’s record high, as more players reported suspected head injuries and medical spotters at games pulled more athletes aside for examination. The league has for years tried to reduce concussions by introducing an array of measures, such as altering kickoffs, limiting the number of full-contact practices and adding extra medical personnel at games. Yet in the five years since statistics on concussions have been published, the decline has been more modest, 6.5 percent, to 244 concussions this season, from 261 in 2012. The league’s numbers encompass concussions sustained during practices and games from the preseason and the regular season.